Among the biggest stories coming from Sony's hacking crisis, the botched attempt to make a Steve Jobs movie stands out, revealing an ugly relationship between top Sony Pictures exec Amy Pascal and producer Scott Rudin. We've now found emails that tell the other side of the story. 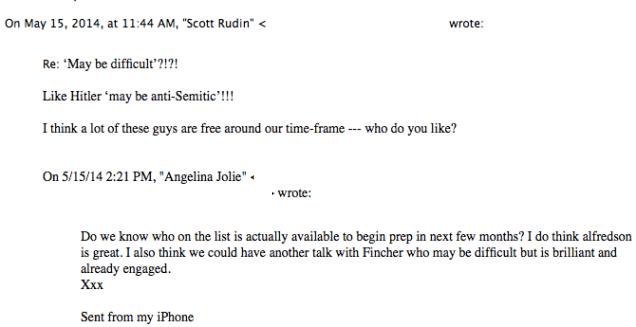 Messages leaked by as of yet unidentified hackers and obtained by Gawker show the slow fragmenting of Pascal and Rudin's relationship, thanks to tension over Angelina Jolie's passion project Cleopatra (and specifically Jolie's focus on director David Fincher, whom Rudin wanted to direct Jobs). What starts out as a genial discussion of a movie idea turns into a battle over wigs, more anti-Angie trash talk, and the general impression that it's impossible and unpleasant to work with any of these people. While Jolie spent 2014 fretting about the script—was she the focus and the prime mover? Did it need a romantic relationship? Would she still be regal enough if she played it bald?—one-on-one correspondence between Pascal and Rudin shows off their behind-the-scenes sniping, scheming, and eye-rolling. Rudin in particular would apparently rather die by self-inflicted asp wound than make another Jolie film: "She's seriously out of her mind," he eventually writes Pascal, exasperated. Meanwhile, Jolie's single-minded focus on Fincher as her director of choice for the project—and Pascal's inability to manage the hilariously ill-mannered Rudin, who also wanted Fincher—became a serious pressure point for all three. It's this friction that would eventually scuttle what could have been a fantastic version of Jobs. Read Part One: "The Nightmare Email Drama Behind Sony's Steve Jobs Disaster"
Exchanges between budding Egyptologist Jolie, and her very supportive producers Rudin and Pascal begin in December 2013, when screenwriter Eric Roth sent the first draft of the movie. "Get your egyptian sandals on ......he did it," Pascal wrote to Rudin and Jolie. "Home run or whatever a home run would be called in Alexandria," Rudin wrote back. At the time, Rudin and Pascal were close: The producer had a first-look deal with Sony—meaning he'd give the studio the first shot at any projects he was working on—and he'd made two previous critically acclaimed Fincher projects, The Social Network and Girl With the Dragon Tattoo. The deal would expire in 2014. So the arrival of Roth's script was an exciting prospect for the trio. " The only thing standing between us and this movie is your learning ancient Egyptian," Rudin wrote to Jolie. "Could you be ready by January 5?" But the script was not quite as much of an ancient Egyptian home run as Rudin and Pascal were claiming. "I think we have to clean up the script and then enhance," Jolie wrote Pascal in early January. "I have crossed out many things and made adjustments. I would like to strip the things that lead it off track first. We need to be clear and efficient in order to get this done in a decent time. I started to re read the book and I am talking to philosophy teachers ect"
The big issues with the script, it seems, involved ensuring that Cleopatra herself—and therefore Jolie—would be the focus of the story. When a new draft arrived in early February, Pascal wrote privately to Rudin that Jolie would prefer this new, even more Cleo-centric version: "She will like it CUZ there is barely any vulnerability left in her character and she now seems responsible for everything that ever happened." But Pascal—like Rudin—was still concerned about making the movie commercial: "We are gonna have to lean on her to make it a love story," she wrote. After another meeting was rescheduled in anticipation of Roth's new script draft, Pascal asked Rudin to call Jolie. Rudin, exasperated, responded " She knows it's off. Calm down. She's an actress for hire, not Cleopatra." This same email thread devolved in manner of the earlier one. "Wanna talk or keep fighting?" Pascal asked Rudin. "Keep fighting right now please," Rudin replies. Nevertheless—as they frequently had and would—the two managed to patch it up quickly, and Pascal attempted soon afterward to suggest other directors for Jobs—"Is it fincher or bob z[emeckis] or marty [Scorcese] or ang [Lee] or alonzo ...there is losts to discuss." Rudin stands firm on Fincher (though not until after he asks who "alonzo" is: "the guy who did gravity," Pascal clarifies). Scorcese to Direct Bald Angelina? Amazing news. I am in edit and only half way through but so far I see that yes it's still long but it's strong and smart and with intrigue and sensuality. I love all the characters and feel it's more focused. Any director in their righting will be happy that it will not be hard to trim and that he will have a say in what stays. The one thought I would ask you both is about her "bald". I think that made sense in earlier drafts but if we are saying every time she's in bed she has no hair or a shaved head it changes the sensuality. I wonder if we should keep it out and discuss as an idea with the director. But I worry we could scare off a director. The point was always that she be clean and raw and I think with straight black hair and no make up we would achieve the same and not distract. I make this point incase we are starting to send it out we should ask to remove that one description. First I thought bald but then I was sitting at home during the night and I couldn't sleep because of it so now I think shaved; Or possibly a fade like Kid 'n Play; Maybe shaved for Alexandria, bald for Rome? And then curly tendrils for the asp? What do you think? Well she was amazing with a perm in that Jewish movie about Daniel pearl. So I'm tempted to throw that look in somewhere but I don't think I can beat you can beat that kid n play look possibly with lots of pearls. Regardless, the star herself wrote, "this is the film I am dying to make." She planned to call Scorcese later in the week. Pascal, for her part, was impressed with the rapport between her egomaniacal producer and her egomaniacal star: She forwarded the exchange to two underlings, Columbia Pictures president Hannah Minghella and SPE Motion Picture Group President Doug Belgrad, with the message "Scott and Angie BFF"
The happiness was short-lived. Jolie and Scorcese didn't meet until May, and Scorcese was booked until 2016. Jolie was impatient to get started on Cleopatra: "Brad is planning a film of the same period you should know," she wrote to Rudin and Pascal. "He will now beat is to it. I suppose giving me more and more time to prepare." Next on the trio's list was Tomas Alfredson, the Swedish director of Let the Right One In and Tinker Tailor Soldier Spy. "Who wants to make the call?" Rudin asked Pascal. "Your more impressive," she replied. "I have more money." "I bet you don't," Rudin retorted. Alfredson was unavailable. In June, Rudin suggested Gladiator director Ridley Scott, and asked Jolie who her "wild card" directors were. "I'm studying a few more films to be sure," Jolie replied. Rudin responded to Pascal privately: "Kill me please. Immediately." Jolie seems to have clearly passed on Scott, and a conversation about 12 Years a Slave's Steve McQueen didn't go further. In July, Rudin and Pascal tried to sell Jolie on directing and acting in Little House on the Prairie; she declined and requested "another Cleo call at some point." And then in mid July, Pascal has an idea. After sending a New York Times piece by Ben Brantley about a London production of Shakespeare's Antony and Cleopatra, she and Rudin took to a private email thread to scheme about convincing Jolie to abandon the clearly inadequate Roth script and just film the play.
" I've been saying let's do this for a year," Rudin wrote. "So obviously the best idea. We ought to make this with her and Fassbender or Hardy or Cumberbatch and go home. And feel very smart." "now we need to convince here," Pascal replied. They worked out a plan: Rudin would reply-all suggesting that the trio make the play. "She will be scared to just totally throw out Eric's script," Pascal wrote, to which Rudin responded, "Yes, we should definitely save Roth over Shakespeare...."
So Rudin attempted to woo Jolie, telling her " The Antony and Cleopatra story is the greatest, most romantic, epic part of the story and Shakespeare told is magnificently. It's the greatest play he ever wrote and it's changed the life of every woman who played it. It's the best female part he ever wrote." Pascal responded at length, "wondering" out loud if maybe the reason "the perfect actress who also happens to be a giant movie star" can't get a director for her movie is that "the script has not given anyone the foundation they are looking for to point the way." But Jolie wasn't having it. Among other things, she didn't think Roth's script was as "off" as Rudin and Pascal did, worse "making it a love story could undermined the female leadership and epic." 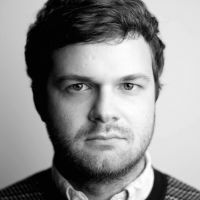 I think we need a good script editor to work with Eric. He's open or will do with me. He knows we need to make it shorter to not be as intimidating. And I think we continue to discuss with great directors. My point is that we have done something special and I don't think we should adjust course but streamline and clarify and hold strong. But of course, I'm open to all discussions. 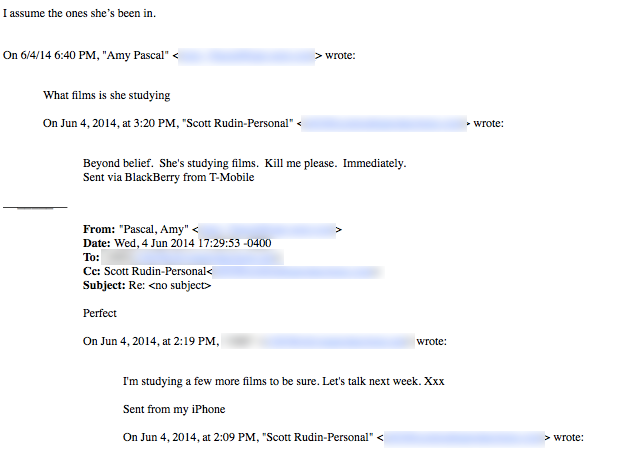 Rudin's reply, sent privately to Pascal, is succinct: " She's seriously out of her mind." "I think we need an in person long conversation the three of us," Pascal wrote; to which Rudin replied, again privately, "Nooooooo noooooo noooooo please! Not a meeting!" Jolie did not reply. Pascal and Rudin's relationship, clobbered by their attempts to juggle Fincher, Jolie, Sorkin, and Roth through two movies—not to mention their desperate efforts to save a disastrous Cameron Crowe film—would end just a few months later. Cleopatra, though, is still alive. By August, Jolie, who'd "already discussed a script editor with Eric," had circled back to Scorcese again, "aiming for 2016." In November, Pascal and Jolie discussed the prospect. "Unbelievably excited," Jolie wrote; Pascal replied: "Me too/Lori and I talked about wigs last night." Now we'll just have to wait to someday see if Cleopatra is worth scuttling Jobs.